Art and biodiversity: sustainable art ? “Interest in ecology and sustainable development is unprecedented, as is to the increasing concern overshadowing society’s well-being. With the news of massive deforestation and the scarcity of water resources, we are continually reminded of how animal and vegetable species are endangered. It’s clear that the need to respect the environment is shared by all but that natural resources are being exhausted through conflict of interest and contradictory action. As a result living and endangered organisms are affected by a kind of universal heritage value, as if representing the memory of an uncertain future. Since the ’60s, artists have testified to, and denounced, through their work, the ravages that human activity has brought on a planetary scale. With art interventions that have taken place in nature or have been an actual part of a landscape, the concepts of the environment, of site and territory, have become more visible in the art world. By demonstrating the physical properties of the material, and of the living, such artworks – whether perennial or ephemeral, in natural or developed spaces – actively call for the spectator’s participation, alternately as observer, walker, or explorer in a double game with the attitude of the artist him/herself. To what extent have the new contours of spatialization in an artwork and art’s modus operandi in general contributed to the change in the way we look at the natural world? What impact has it all had on increasing the general public’s awareness, and of protecting our environment? – Are researchers, and artists, in the face of environmental challenges: the new crisis managers? – Eco-art, the green esthetic, neo-naturalism, sustainable art? – The eco design approach, and individual commitment? Authors are invited to propose texts of between 10 000 and 20 000 characters/signs (not including spaces). Contributions can contain up to 10 images with a resolution of 72 dpi. Images should be sent separately, with mention of their place, title and source. The same goes for pictures and other illustrations under format image. The first page must contain: the title of the article, the name of the author(s), their affiliation, email and postal address, a summary of 10 to 15 lines and a list of keywords characterizing the contents of the article. 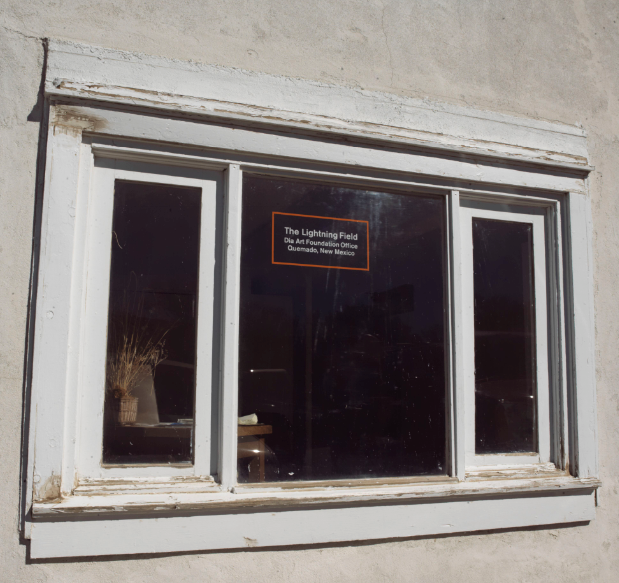 An interesting article on www.artnews.com, written by Robin Cembalast, gives insight about the impact of Hurricane Sandy on the art community in New York and shows that Sandy could have been the wake-up call for the community to realize that action against climate change is required on their part. A more radical art project concerned with Global Warming is the Greenhouse Britain by theHarrisons, as it addresses resettlement as the final consequence of climate change and shows how artists can work with architects and urban planners to redesign cities and neighborhoods. Of course this proposes a more drastic approach to the reaction to climate change and arts’s role in it, as it asumes that rising water levels are inevitable and that the then displaced population will need a differently designed civilization. But maybe adaption to climate change will require this kind of transformation? For the whole article at artnews.com, click here. On June 16th, Cultura21 – together with partners – invited panelists with broad experience and knowledge concerning the art sector and the human rights situation in China for a discussion around the arrest of Ai Weiwei. The event was attended by more than a hundred people of all ages. One week after the event, on Wednesday June 22nd, we were very glad to hear about Ai Weiwei’s release, almost three months after the arrest at the Beijing Capital Airport. The panelists debated the role of Ai Weiwei and the international media. “He may be famous in the West but within China his popularity/name-recognition is limited, which is also due to censorship”, said documenta12 director Roger Buergel. The panelists agreed that the Western media portrayal of Ai Weiwei is overly simple as it does not address the complexities of the art world in China or the human rights situation. However, it was pointed out that the media’s attention on Ai Weiwei does not alleviate the need to draw attention to the bigger picture of the current crackdown on many human rights activists. Ai Weiwei’s disappearance demonstrated that no one is safe from the strong arm of the government if he or she criticizes the government publicly and on issues considered ‘very sensitive’ by the authorities, such as the issue of shoddy construction in Sichuan which was deemed responsible for the deaths of thousands of students in the 2008 earthquake. The frustration and discontent of a majority of the Chinese population in the face of economic inequality and social injustice is boiling over in many ways, and in Ai Weiwei such anger finds an outlet that has tremendous reach in the international community (thus making him an increasing threat to the regime). The Chinese government often argues that it has lifted millions out of poverty and that the Chinese people are freer now than ever before. Such propagandistic arguments mask the reality that the increasing wealth of the state strengthen the government’s ability to control domestic unrest and activism. It has been reported that for the first time spendings on public security have exceeded those of national defense/military. Even in the current context of aggregate economic growth, there are thousands of public demonstrations per year recorded. Artists take great risks to engage themselves in social activism, but they are a minority among the various groups that advocate for human rights and rule of law. Not all artists take political positions and many do not. Many artists are elitist and urban-based and their main objective is fame and profits. Some who wish to make political statements through their art also face other real-life restraints, such as finances. Foreign funding to domestic institutions, including NGOs, is heavily scrutinized, manipulated and restricted by the authorities. There is a need to better understand the complexities in China in order for external actions and advocacy be effective. There is worry that external demands may be seen as ‘colonial’ and would certainly be spinned this way by the Chinese government to generate nationalistic support among the population. On the other hand, silence is not an option. In fact, strong public outcry, including rumors that Ai has been tortured, may have forced the government to let his wife see him and prove that his physical condition was fine. MELD is a new initiative based in Greece which understands the arts to be part of the means to address Climate Change because the arts can be a collaborative catalyst as well as a catalyst of social change, a catalyst for economic growth and also a marketing tool. On the other hand you might also be interested in Brett Bloom’s (of Temporary Services) article Radical Space for Art in a Time of Forced Privatization and Market Dominance which focuses on how not to be part of the ‘art world,’ but to find new means now, resisting the corporatisation of art. While political demonstrations traditionally pit two opposing ideologies against each other–think World Trade Organization meetings and anti-globalization activism–the demonstrations and activities around the 15th annual Conference of the Partners (COP15) were surprisingly complimentary to the talks themselves. The grassroots activists were not opposed to the political maneuverings, but rather wanted to see them go farther. This “will to move forward” allowed for creativity in demonstrations and amplified artistic activism. Curation at local museums and art sites took advantage of the agreed-upon topics of COP15, setting programming well in advance. The more guerilla forces of the art world seized the collective momentum, and artistic presentation during the two-weeks of the climate summit spanned from museum gallery to street happening. While the politicians represented their national agenda, the artists represented the natural world. The Nation Gallery of Denmark laid the ground work for understanding the environment through artistic representation with their exhibition “Nature Strikes Back: Man and Nature in Western Art”. The aggressive titling is meant to communicate the show’s theme of man seeking dominance over nature. It focuses on how nature in art is rarely a direct representation, but a symbol for itself and man’s relationship to it. This relationship is articulated through five themes: Exploitation, Human Nature, Order and Systems, Landscape and Disaster. Within the exhibition, “Nature Strikes Back” offers a picture of nature that highlights a clear separation between man and the natural world. A significant point is made to articulate the significance of the landscape conceptually. Having not appeared in European language until the late 16th Century, the word ‘landscape’ has a loaded history of invoking ownership of that which is depicted. This exhibition also clearly addresses the issues of where the border between our inner and outer natures lie, our sense of the idyllic and edenic paradise, as well as our attempts to organize. The story here is one of control and mastery of the physical world and its latter-day break down. The strike which is being made in return is one that equates judgement day to severe climate changes as retaliation against our enclosure and exploitation. This conclusion keeps man at the center of the issue though, which is problematic. It continues to define nature as a logical system to which we stand opposed and from which we will see active retaliation against our harmful activities, missing the mark on man’s inclusion within natural systems. “Nature Strikes Back”, and its importance, is clearest when its relationship to another exhibition called “Rethink: Contemporary Art and Climate Change” is considered. “Rethink” is an extensive exhibition of installations displayed across four institutions in three spaces and the virtual world. This exhibition was also divided thematically, though perhaps more opaquely by its titles: Rethink Relations at the National Gallery of Denmark, Rethink The Implicit at the Den Frie Centre of Contemporary Art, Rethink Kakotopia at the Nikolaj Contemporary Art Center, and Rethink Information, which was on the Internet at a satellite exhibition at the Moesgård Museum (in Århus) and as public performance throughout Copenhagen. Man at the center of natural representation, as found in a traditional gallery format, provides the historical background of “Rethink” both in the sense of nature in art and traditions in presentation. 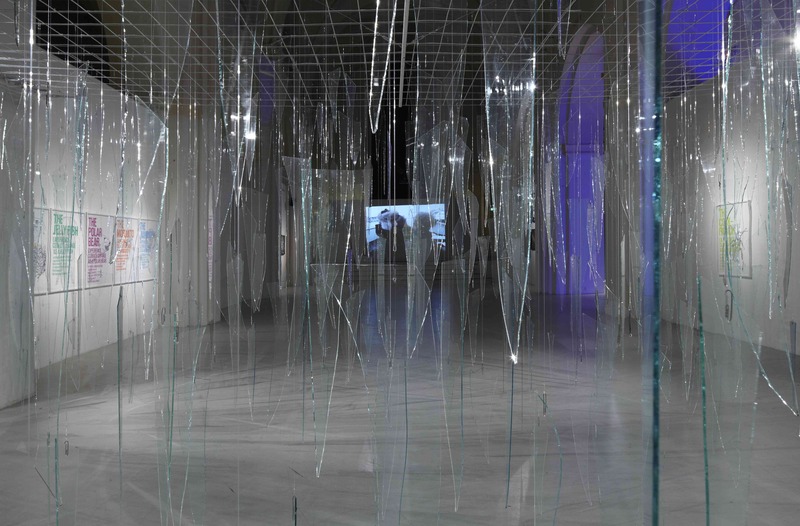 This exhibition of contemporary pieces focuses primarily on generative and phenomenological work, with many articulating systems through demonstration and/or dramatization instead of classification. Programmed into a heavily ambulatory, semi-public space, without a fee, dynamically connected to its other locations through virtual space, “Rethink” is not just contemporary work, but contemporary presentation. 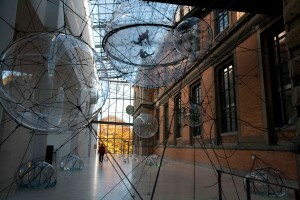 The work not only speaks to being connected to natural systems like in Thomas Saraceno’s “Biospheres” and Olafur Eliasson’s “Your Watercolor Machine”, but is placed in shared open space diminishing barriers to access and the creation of connection to the work. Together, these exhibitions, including the other locations of “Rethink”, serve as a history and foundation for looking at other artistic endeavors in Copenhagen. Individually they look at representations of our understanding of the natural work. “Nature Strikes Back” represents it as something to be classified and contained, while “Rethink” represents it as something to be experienced and studied. Paired, they reflect what has changed in our perceptions over time. And, while they inform one another, they inform the less mainstream exhibitions outside of curated space even more. Millennium Art’s “CO2 Cube”, featured in this issue of the quarterly, uses a methodology befitting inclusion in “Rethink”. 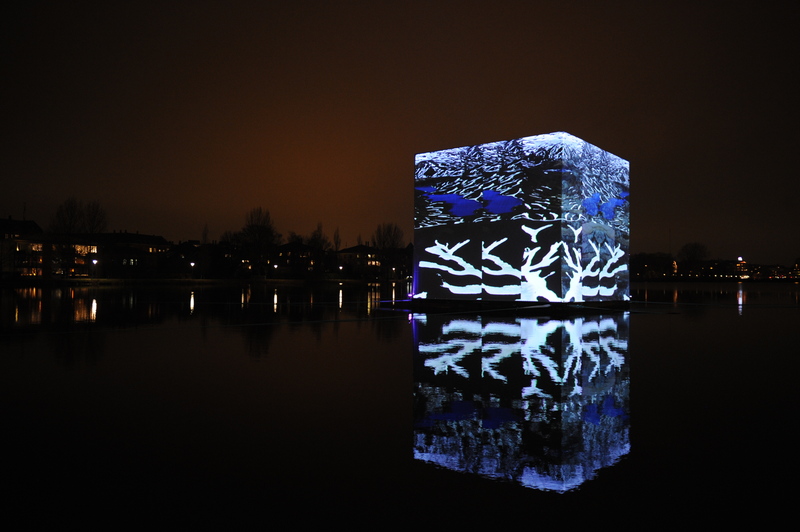 It is a 27 square foot cube, reflecting the volume of one ton of carbon dioxide, and floated in the lake adjacent to the Tycho Brahe Planetarium. It features current data and video about climate change, pulled from the internet that day, streaming across its two faces which are closest to shore. While its form articulates a natural relationship of man in the contemporary world (this volume of CO2 is what the average american produces in two weeks), the media reflected on its service aims for immediacy even with the lag created by the curatorial impact of the projects relationships with the United Nations, Google and YouTube. One can also look at the example of “7 Meters”, also featured in this issue. It is a project that’s primary visual impact was in the plentiful flashing red LEDs mounted at seven meters above the ground to reflect the anticipated sea level rise should the ice of Greenland melt. Using projected data, it creates an expansive experience throughout Copenhagen, representing the ghost of climates future by tracing a drastic change in the immediate surroundings. And there is also Mark Coreth’s “Polar Ice Bear”, a polar bear skeleton embedded within an ice sculpture of the same bear, left to melt in public. It exchanges data for exposure to the elements. While it never completed melting due to sub-zero temperatures later in the conference, it combined a known symbol of climate change (the polar bear) with a phenomena of climate change (melting ice) to produce an effective and connective experience through its thematic representations. Both of these projects connect directly to both their immediate environment and larger environmental issues. All three of these examples were presented in public, high traffic spaces. They focus on a human relationship by representing our downstream effects, both immediate in the sense of the cube as our CO2 output, and that which is more abstract, as with the Ice Bear’s melt created by ambient temperature (which we have a long term collective effect upon). And so, these factors articulate the next step beyond the exhibitions of “Nature Strikes Back” and “Rethink”. They continue the narrative of natural interconnection and immediateness and highlight the core difference between those gallery shows. Whereas “Nature Strikes Back” articulates man vs. nature, “Rethink” and these public space exhibits articulate man with nature. 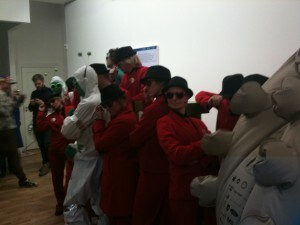 The red-suited, fedora wearing Climate Debt Agents (who sing), the similarly attired, but otherwise hued Mr. Green of OxFam, the aliens of Azaaz.org, the awards-night ambiance of the “Fossil of the Day” awards. These costumed, theatrical performances infuse humor and inclusivity into the plain-clothed protesters and demonstrators. In these performative, engaging acts, once can see that the opposite of cataloging nature is taking action on its behalf. These creative, complimentary demonstrations blur protest and performance art, and exist in the realm of happenings. The Yes Men, artists who practice ‘identity correction’ by appearing as high-powered spokespersons of corporations, were most noted for their series of press releases on Monday, December 14, 2009. Teamed with Thierry Geoffroy, a.k.a The Colonel, and headquartered at Gallery Poulsen, the Yes Men created what was likely the most effective and affective of actions, where this performance/protest integration was most clear. They called into question Canadian environmental policy through a series of official-seeming statements that were authentic enough to fool news organizations for a number of hours during the day. This temporary hijacking of political identity no longer relies on the representational visual articulations we see in the National Gallery. Instead this direct, subversive action on the behalf of the natural world–using the authentic voice of the Canadian government–represents nature back to man through advocacy, rather than through symbols. The New Life Festival, organized by Wooloo.org, did not produce or display art itself, but enabled the hosting and accommodation of visitors in Danish homes. It arranged housing for over 3,000 artists and activists during COP15. This allowed many people who otherwise could not afford to be present to observe this moment in history. The New Life Festival also addressed perceptions of Denmark’s closed-off society. Primarily documented with guest books meant to help the guests and host families get to know one another, this project has completely forfeited aesthetic representational work, symbolism or synecdoche. Instead it has enabled direct representation, articulating a peopled mass by enabling it to gather. 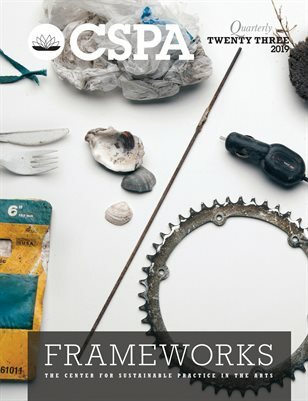 Along with the ambitious collection of interviews by Open Dialogues, a literary UK collective, the ecological burial contracts from the Danish art group Superflex, and the anti-Coca Cola campaign from the Yes Men, these projects define success through congregation and collective energy in defense of the natural world. Working in the name of art, they give voice to two key entities absent from COP15: planet and people. In light of what is widely regarded as the failure of COP15 itself, having been unable to reach a binding agreement politically, there is hope and elements of success to which the arts can speak. Closing the Bella Center to NGOs, and the addition of a second credentialing process (meant to remove non-political dialogue from the meetings), underscores this ‘success’. That decision reflects a perceived threat from those who did not represent a political body’s or a nation’s political interest: the people in support of the natural world itself. This group that threatens the political process is the success of these two weeks in Copenhagen. It is a group from around the globe, from all walks of life, which is made of people that are as varied as the ways a changing climate will affect them, and which is reified by gathering and identifying itself as a mass en masse. How should the artworld be responding to the issues of sustainability and the environment? Dialogue editor Lucy Gibson looks at why the arts should be leading the way on climate action, rather than looking to corporations and science for moral leadership. But in a sector made up of many individuals and small organisations, alongside enormous institutions, why and how can change really be affected? 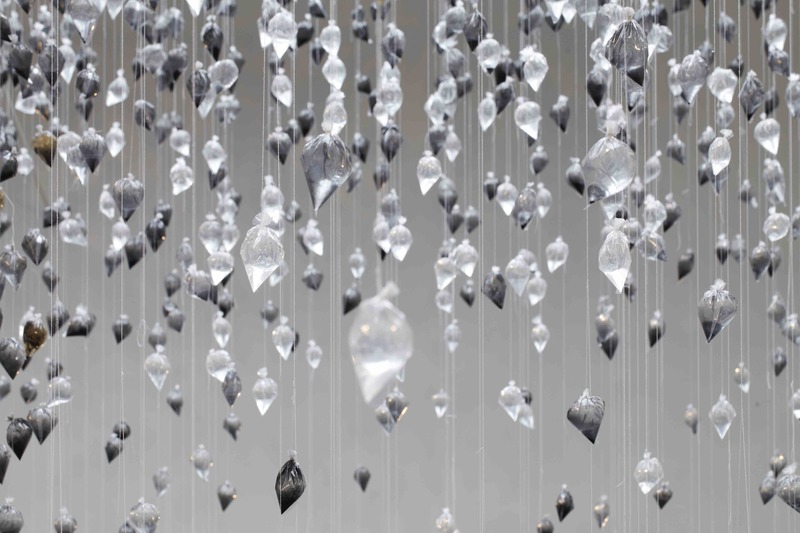 Eco-bling: why the arts sector needs to lead on climate action is an interesting article from Lucy Gibson. Take a look at the source when you have a moment. It should make the art world blush to hear a leading arts and environment activist stating that Walmart, followed by Coca-Cola, Unilever and Tescos, have done more than most in dealing with the impact of climate change. But that is exactly the message from Alison Tickell, Director of Julie’s Bicycle at the Arts Council England’s ‘A Low Carbon Future for the Arts?’ consultation meeting in February. 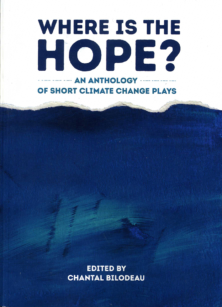 ‘Why do we expect moral leadership to come from corporations and science?’ asks Tickell, ‘Surely the meaningful nature of the arts in society puts it in a position to take a lead on climate action? Contemporary art about climate change is still sometimes seen as the frivolous dilettante who has showed up late to what it thinks might be an interesting party. Actually, activists think everyone is slow to grasp everything, but anyway… It’s less that art has been slow to grasp the significance, more that art rarely produces the kind of loud kazoom that activism does – or wants it to. To many this remains a source of huge frustration. James Mariott of Platform, which programmed the lively 100 Days strand at the Arnolfini in the run up to COP15, expresses continued frustration at the artworld’s timidity. Art, Sillito seems to be saying, has the disruptive power to reach the mass unconverted by activism and reason. You see, it’s not so much that art is even late to the party. But it is true that at times art is not exactly sure what it is doing there. In a few days the Culture|Futures symposium kicks off in Copenhagen. The symposium, led by the Danish Cultural Institute and a partnership of arts organisations from around the world, is based on the premise that the scale of the transition to the environmental age is so massive that just waiting for the right technological or political solution to show it self is not enough. It requires fundamental cultural change, and very fast change. Apologies for the hiatus over the last few days: swine flu. Did art help add the sheen to Dubai? The party is over in Dubai. It was always based on a boom. And art is always there when there is a boom. It had its foot in the door of the contemporary art fair circuit. Christies had set up shop there. The RSA Arts & Ecology Centre took part in the 8th Sharjah Biennial – leading a major symposium on arts and ecology…. Simon Jenkins excoriates those who took part in what was effectively a massive PR to suggest that Dubai was the city of the future, when its sustainability was always in question. As the debt bubble bursts, does the art world share some of that blame for joining in the party? It has been over 20 years since I was in New Mexico. When I considered why this was, I realized that most of the places I’ve traveled to for art events in the US have been where CAA, AAM, or AFTA conferences usually take place, like Los Angeles, Philadelphia, Seattle, San Francisco, San Diego, Atlanta, and New York City. I guess a city needs to have at least 1,500 contiguous hotel rooms adjacent to a conference center to host a large conference, which Albuquerque does not have (yet). In general, most people travel to Santa Fe to see the opera, go to galleries and in the last decade to visit Site Santa Fe, an international contemporary art biennial that began in 1995. This is a town that boasts over 250 galleries with under 150,000 residents! With so much focus on the arts, it seems like there should be more of an “art world” presence. Even Lucy Lippard, Nancy Holt, and Bruce Nauman call New Mexico home (out of approximately 1 million people in the entire state). And, it is the home to Walter De Maria’s The Lightening Field. Last spring I was invited to give a lecture in November at the University of New Mexico, Albuquerque by Bill Gilbert, artist, professor and founder of The Land Arts of the American West program (2000). I had seen a call for artists for a LAND/ART New Mexico project in fall 2008 and was curious who all was involved. When the program was formally announced and I saw that they had organized multiple events, exhibitions, site-specific installations, lectures, and plans for a publication, I was very impressed with the scale and proud to be included. The program began in May and will wrap up in November. 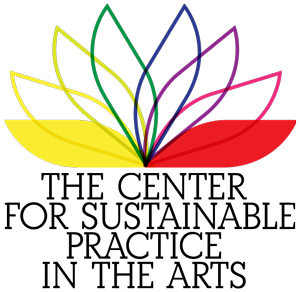 Over 25 organizations in New Mexico have participated with 516 Arts, Suzanne Barge – Project Coordinator, taking the lead. Formally titled Land Art: Art Nature Community, a collaborative exploration of land-based art in New Mexico, the program has exhibited work by international artists including the Center for Land Use Interpretation, Patrick Dougherty, Andrea Polli (the new Director of the Interdisciplinary Film and Digital Media (IFDM) Program at UNM), Eve Andrée Laramée, Erika Blumenfeld and important art and ecology artists from New Mexico including Basia Irland, William Gilbert, and Catherine Harris (recently appointed Art & Ecology professor at UNM). The list of guest speakers included Rebecca Solnit, Nancy Holt, David Abrams, and a performance and discussion with Laurie Anderson, just to name a few. The program was a herculean effort and is to be commended. 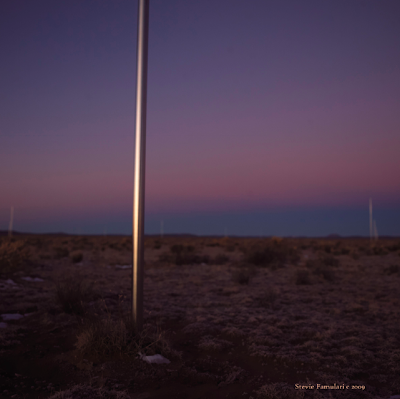 I would highly suggest getting a copy of the culminating LAND/ART New Mexico book due out in December including an essay by Lucy Lippard. And, add to that list the recently published book Land Arts of the American West documenting the program of the same name by William Gilbert and Chris Taylor. One of the highlights of my trip was going to The Lightening Field (TLF). 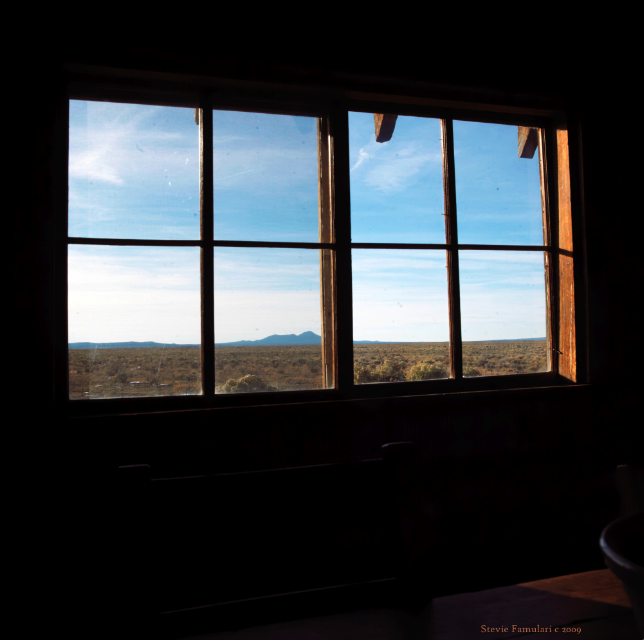 It was on my list of things to do for many years and seemed the right time to do it being in New Mexico for the Land Art program. When I arrived into Albuquerque Airport there was a fresh layer of snow on the ground. Driving to TLF from Albuquerque takes about three hours, south and west towards the Arizona border. 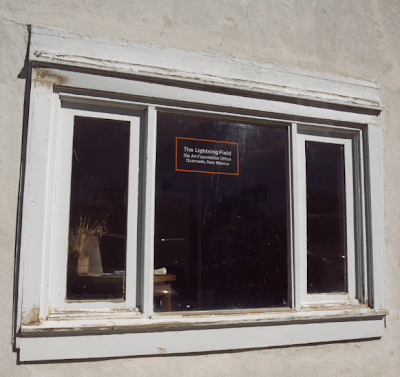 In the small town of Quemado you sign in at the DIA Foundation office. Here you leave your car and Robert Weathers, TLF manager, drives you out into the middle of nowhere to a WPA era cabin about 45 minutes away. After checking out the rustic chic accommodations (great sheets/towels and Hudson Bay blankets), and getting to know my cabin mates (Stevie Famulari, Assistant Professor at NDSU and environmental artists, and Paul Socolow, a Bay Area de-employed Land Art aficionado), we three ventured out into the field to take a look. This was Stevie’s second trip to TLF and she was well versed how to experience the work. About an hour before sunset she prompted us to get outside (it was around 30 degrees, expecting to drop below 20 at night). As we walked out into the poles the sunlight was shining bright on the stainless steel tips which were not as tall as I had imagine and lighter and more flexible than I would have thought. The rounded tips looked so sculptural and rocketship like. It took a while to get it, but walking inside of the field of poles is when you feel like it is an artwork, not looking at it from the distance like it is an object. It expands the longer you walk inside the poles, it seems to gain another row and another row as the darkness sets in and the setting sun reflects on the poles. We were walking in mud and snow, which was building up on our shoes while noticing rabbit holes and horses hoof prints along the way. It was a full moon, the sky was clear, although hard to see the poles after the sun had set. In the morning as the sun comes up the poles to the west are most visible, in reverse of last night where the eastern portion of the field was most visible at sunset. TLF was installed September – October in 1977. In fact October 31st, the next morning after staying over night was the 32nd anniversary of TLF and the last day of the season for staying over night until next April. In 1974 there was a test field in Northern Arizona (later owned by Virginia Dwan and donated to Dia unassembled in 1996). 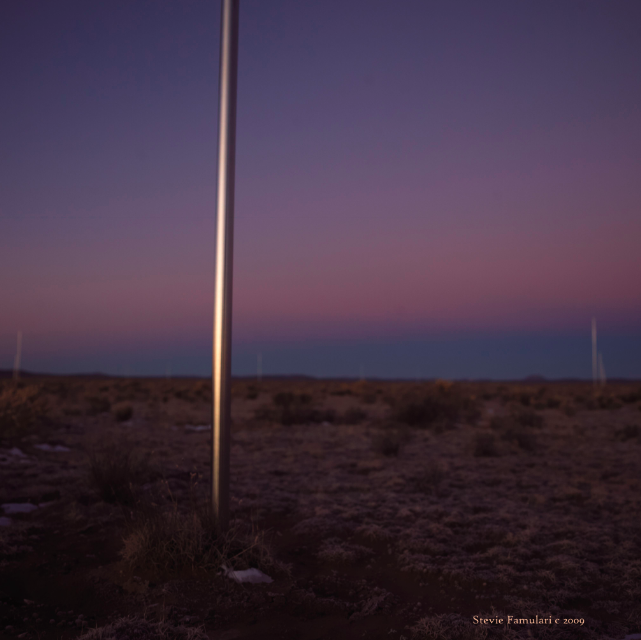 There were 35 stainless tell poles with pointed tips each 18 feet tall and 200 feet apart. The land was owned by Mr. and Mrs. Burton Tremaine. It resided there from 1974-76, then was moved. LOS ANGELES, CA – Los Angeles’ own living legend Rachel Rosenthal has a lot to celebrate this November! The interdisciplinary performer, animal activist, master teacher, and iconic artist will be honored on Saturday, November 7, 2009, with the cultural event of the year – “Rachel Rosenthal’s Birthday Bash 83.” From 7:00 to 11:00 p.m., Track 16 Gallery at Bergamot Station in Santa Monica, California will host the occasion, which will celebrate Rosenthal’s 83rd birthday, the release of her upcoming book The DbD Experience: Chance Knows What it’s Doing!, and will announce her Company’s new performance troupe, TOHUBOHU! Extreme Theater Ensemble. In honor of the 83 years Rosenthal has spent on the planet, the event will feature an exhibit and silent art auction of the highest caliber. The auction will include 83 abstract, conceptual, and representational “portraits” of Rosenthal in a diverse range of media by exceptional established and emerging artists including a number of art world legends such as John Baldessari, Mike Kelley and Robert Rauschenberg*. Admission will cost $25. Tickets will be available online through Rosenthal’s site and at the door on the night of the event. Track 16 Gallery is located at 2525 Michigan Ave. Building C1, Santa Monica, CA 90404. For more information on the venue, please call 310-264-4678 or visit http://www.track16.com. For more information on Rosenthal and this event, please call 310-839-0661 or visit http://www.rachelrosenthal.org. The 83 artist works being donated for the event’s exhibit and silent auction are from a mind-blowing array of artists. In addition to Baldessari, Kelley and Rauschenberg, art world luminaries such as Lita Albuquerque, Eleanor Antin, Judy Baca, Llyn Foulkes, George Herms, Martin Kersels, Ed Moses, Lee Mullican, Betye Saar, Masami Teraoka, Patssi Valdez, and June Wayne have confirmed their involvement. For a full list of participating artists to date please visit: www.rachelrosenthal.org/rr/party.html. Auction proceeds will support Rachel Rosenthal Company’s TOHUBOHU! Extreme Theater Ensemble performances, student scholarships, and visiting artist stipends. This special evening will also include a Champagne toast, an outrageous cake created by Joan Spitler and Leigh Grode of the world-renowned Cake Divas, and live music by Amy Knoles from the California E.A.R. Unit as well as Jean Paul Monsché of the Mad Alsacians. Rosenthal’s long-awaited book, The DbD Experience: Chance Knows What it’s Doing!, a mix of memoir, philosophical musing, manifesto and teaching manual, will be published this fall by Routledge. DbD (Doing by Doing) is Rosenthal’s signature brand of improvisational theater. This is the first time she has written about her teaching methods. In the 168-page book, she explores improvisational theater and its relationship to life, offering a blow-by-blow account of what happens in Rosenthal’s 32-hour DbD weekend intensive workshops. Throughout the book, she describes the processes and exercises she invented and developed over the last fifty years. Routledge, a global publisher of academic books, journals and online resources in the humanities and social sciences, will release the book in the UK this October, and in the US in December 2009. Rosenthal opened her studio, Espace DbD, on Robertson Boulevard in Los Angeles in 1980. From 1980 to 1983, Rosenthal presented performances by many emerging and established performance artists including Barbara Smith, Eleanor Antin, Cheri Gaulke, Alan Kaprow, John White, Joyce Cutler Shaw, Tom Jenkins, and many others. Rosenthal founded The Rachel Rosenthal Company as an educational non-profit arts organization in 1989. Rosenthal’s teaching methods were inspired by Jean-Louis Barrault‘s concept of “Total Theatre” and Antonin Artaud‘s “Le Theatre et Son Double.” What emerged is a zen-inspired performance aesthetic that integrates text, movement, voice, choreography, improvisation, costuming, lighting, and sets into seismic experiences. She has been nurturing a new troupe of performers that she will introduce to the world as her TOHUBOHU! Extreme Theater Ensemble in January 2010. Rosenthal has performed in over 100 venues around the world including documenta 8 in Kassel, Germany, The Helsinki Festival, ICA London, The Performance Space in Sydney, The Whitney Museum in New York City, and Museum of Contemporary Art here in Los Angeles. The Pompidou Centre recently included her in its 2006 show Los Angeles 1955-1985. Her pioneering performances have earned Obie, Rockefeller, Getty, NEA and CAA awards, among others. Born into an affluent Russian-Jewish family in Paris, Rosenthal’s father, Léonard Rosenthal, was a gem merchant widely known as The King of Pearls. During World War II, her family escaped France, moving to Rio de Janeiro by way of Portugal. After losing his material wealth to the Nazi’s, her father had to start over at age 65. In 1941, the family left Brazil to settle in New York where Rosenthal graduated from the High School of Music and Art and became a U.S. citizen. She studied art, theater and dance in Paris and New York after the war with such teachers as Hans Hoffmann, Merce Cunningham, Erwin Piscator, and Jean-Louis Barrault. 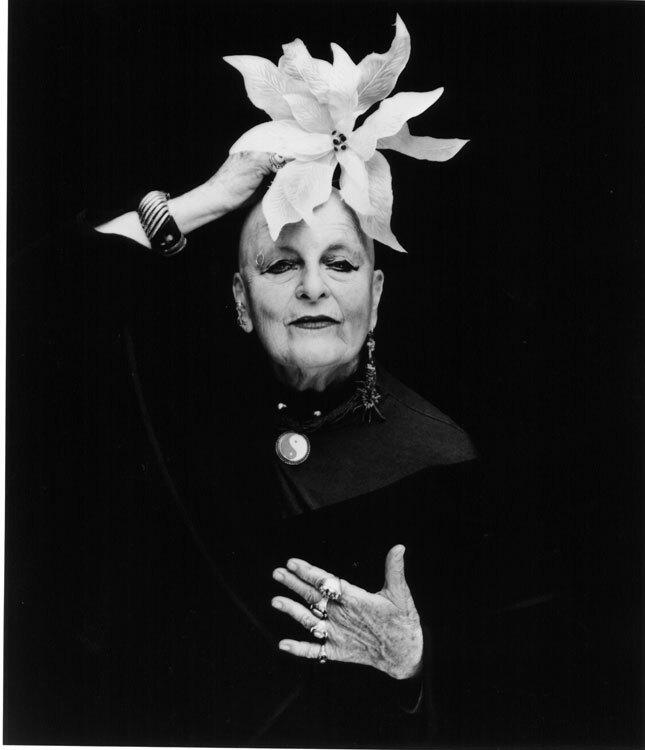 Rosenthal began her theatrical career in Los Angeles in the mid-1950s as artistic director and performer in her totally improvised “Instant Theater” for its ten-year run. A leading figure in the Southern California Arts movement of the 1960s and 1970s, Rosenthal was a pioneer in addressing feminist and animal rights issues, and was a founder of “Womanspace,” a hotbed of feminism. In 1999, Rosenthal received an Honorary Doctorate from the School of the Art Institute of Chicago; and in 2000 she was honored by the City of Los Angeles as a “Living Cultural Treasure of Los Angeles.” Critics have called her “a monument and a marvel” and Richard Schechner, editor of The Drama Review (TDR), put Rosenthal into the same category as Robert Wilson, Ping Chong, Richard Foreman, Meredith Monk, and Laurie Anderson. * Thanks to the Estate of Robert Rauschenberg, one of the 83 donated works for the auction is of particular interest. Among the silent auction items is a 1994 Rauschenberg print honoring Rosenthal. This piece is from Rauschenberg’s “Tribute 21” suite of prints – a portfolio that pays tribute to inspirational leaders – 21 artworks, celebrating 21 humans, all impacting themes in the 21st century such as peace, social justice, and a sustainable environment. In the portfolio, Rachel Rosenthal shares company with illustrious world figures such as Nelson Mandela, Toni Morrison, Jacques-Yves Cousteau, Carl Sagan, Buckminster Fuller, and the Dalai Lama, among others. For more information, photos, or to request an interview, please contact Green Galactic’s Lynn Hasty at 213-840-1201 or lynn@greengalactic.com.